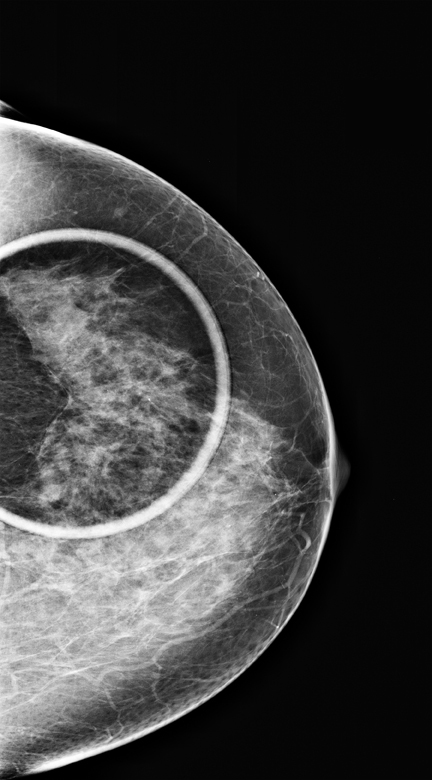 A 74-year-old female presented for routine screening mammography. She had undergone screening mammography yearly for the past several years, and her mammogram last year was interpreted as normal. She underwent a surgical right breast biopsy 32 years ago that yielded benign results, and had no family history of breast cancer. She has used hormone replacement therapy since menopause. A 2-dimensional (2D) mammogram revealed heterogeneously dense breast tissue without focal masses or asymmetries and without changes when compared to earlier mammograms (Figure 1). 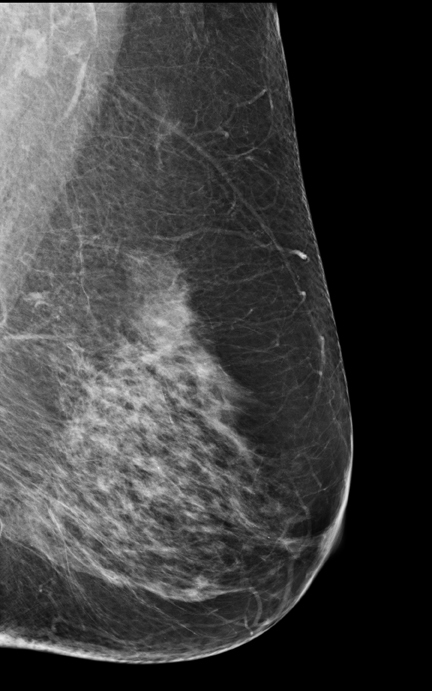 A 3-dimensional (3D) mammogram revealed an area of architectural distortion in the lateral aspect of the left breast, seen on the CC tomosynthesis view only (Figure 2), estimated to be at the 3 o’clock position based on its tomosynthesis slice number. The patient was asked to return for additional mammographic views and an ultrasound. 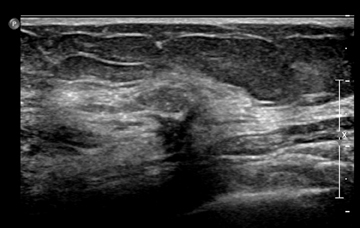 CC and MLO spot-compression views demonstrated no definite abnormality in this area (Figure 3), but a targeted ultrasound revealed a 5.5-mm spiculated mass at the 3 o’clock position (Figure 4). Pathology results yielded an infiltrating and in-situ carcinoma, with the well-differentiated infiltrating component measuring 1.1 cm and demonstrating tubulolobular features, nuclear grade 2, ER/PR receptor positive, HER 2/neu receptor negative. The grade 2 in-situ component measured 0.3 cm. Other associated findings included a radial scar, multifocal atypical ductal hyperplasia, and lobular intraeithelial neoplasia. Two left-axillary sentinel lymph nodes were negative for metastatic carcinoma. 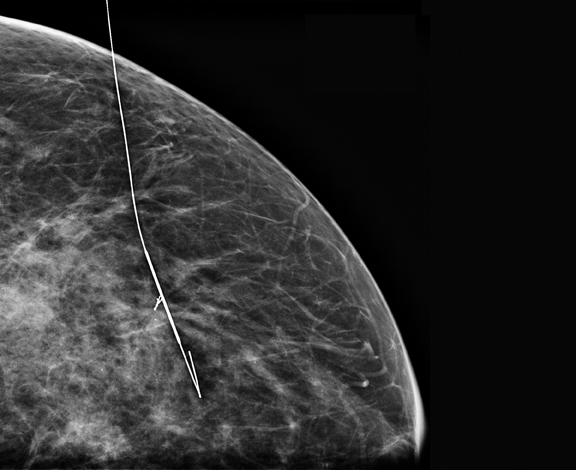 The patient underwent a mammographically-guided needle localization and a lumpectomy (Figures 5 and 6), followed by whole breast radiation therapy. She was advised to cease hormone replacement therapy. 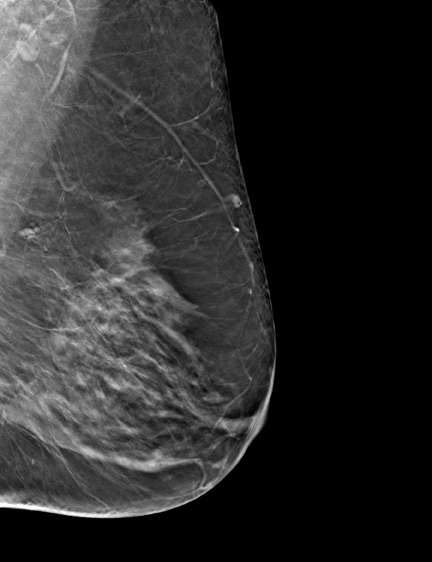 Breast tomosynthesis enabled us to detect a small, early stage carcinoma in this patient with dense breast tissue, while there was no abnormality detected on conventional 2D digital mammography. 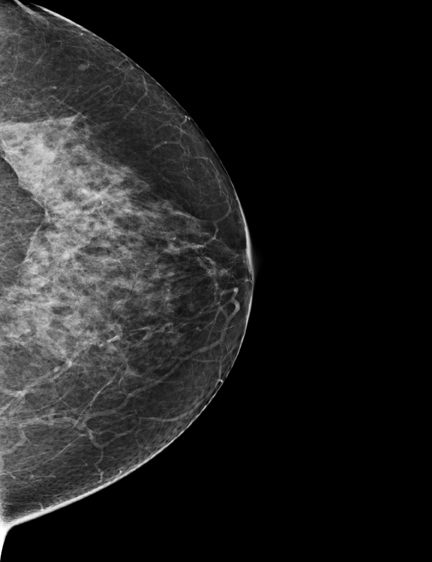 Findings seen in one view only on conventional 2D mammography frequently present a significant challenge. In this instance, the finding was seen on the CC tomosynthesis view only and we were able to localize this finding to the 3 o’clock position in the breast secondary to its tomosynthesis slice position. 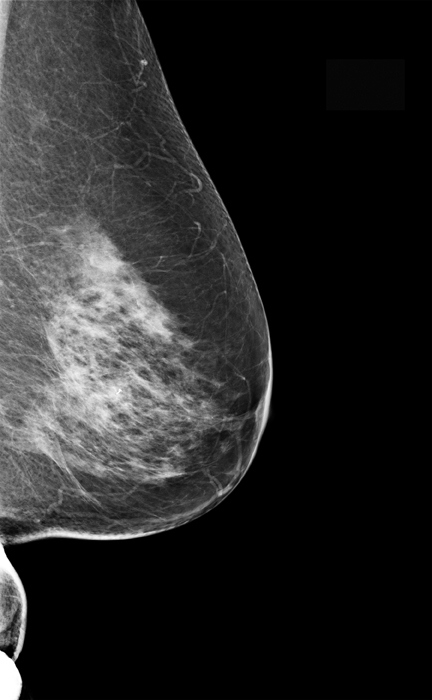 Three-dimensional breast tomosynthesis may allow the detection of small cancers, which could otherwise remain unseen until they become significantly larger or even palpable. It may be superior to spot compression views in the evaluation of asymmetries and architectural distortion. Svahn, TM, Chakraborty, DP, Ikeda D, et. al. 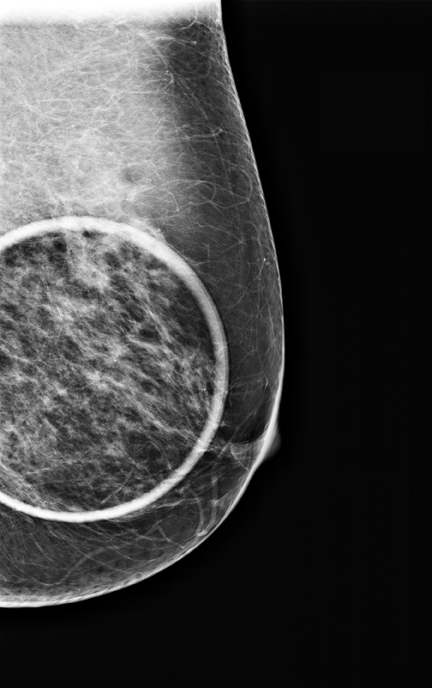 Breast tomosynthesis and digital mammography: A comparison of diagnostic accuracy. BR J Radiol. 2012;85: e1079-1082. 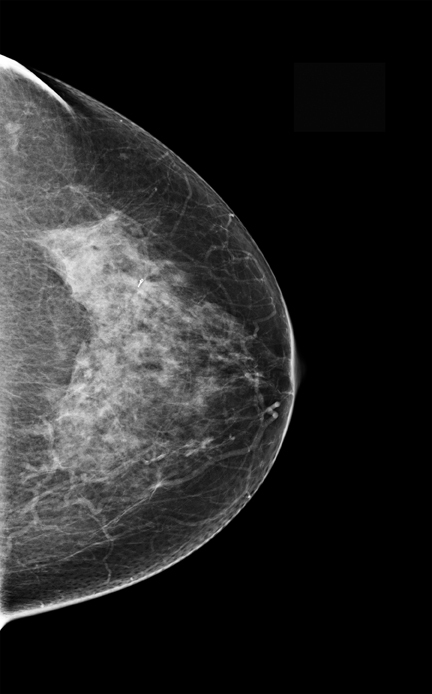 Stage 1 breast cancer diagnosed by tomosynthesis in dense breasts. Appl Radiol.